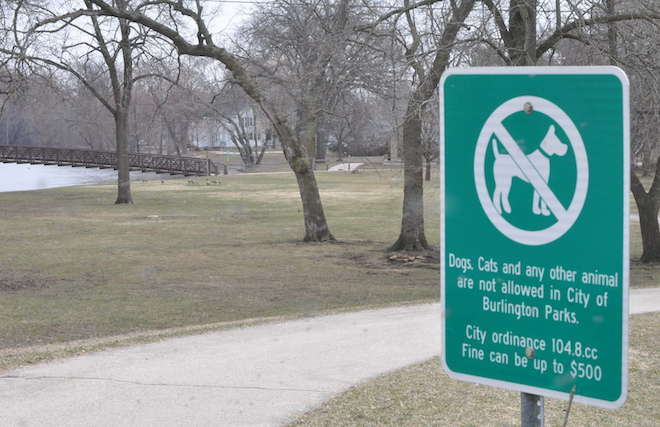 Dog owners will be able to take their animals to all City of Burlington parks after the Common Council adopted an ordinance following two amendments at an April 3 meeting. The final ordinance passed on a 6-2 decision with District 3 Aldermen Steve Rauch and Jon E. Schultz II as the two opponents of the matter. Initially, the ordinance presented before the Common Council barred dogs from picnic areas, instead of the Chocolate Festival grounds during the annual event. Two council members believed picnic areas were either too restrictive or were not a focal point of discussion at previous meetings. District 2 Alderman Ryan Heft, who brought the concern before the Common Council on Feb. 20, indicated picnic areas were too restrictive. “The only thing I want to amend is picnic areas,” he said. District 1 Alderwoman Susan Kott agreed, adding she did not recall discussions specifically mention picnic areas. “I was surprised to see it in the wording,” she said. In response, Director of Public Works Peter Riggs told the Common Council he drafted the ordinance as presented because some council members said in the past they had concerns about dogs in areas where children congregate. “I tried to structure it in a way that provided you guys some flexibility if you needed to change things,” Riggs added. In the first amendment, Heft motioned to delete picnic areas from the ordinance and seconded by Kott, which passed 6-2 with Schultz and Rauch as the two opponents. Kott, however, did have concerns about the annual Chocolate Festival, where hundreds of people converge and could create safety concerns. “There are a lot of people, and suddenly, there are dogs everywhere on leashes and kids running,” she said. Kott motioned to amend the ordinance to make reference to the annual Chocolate Festival and it was seconded by District 4 alderman Thomas Preusker. The second amendment passed 5-3 with Theresa Meyer (District 1), Bob Grandi (District 2) and Todd Bauman (District 4) voting against the measure. To read the entire story see the April 11 edition of the Burlington Standard Press.